“I’m not a star – I’ve never wanted to be,” says Barnt Green musician, singer and songwriter Paul Edwards, and he means it. For Paul, who has spent just over 40 years writing and performing, the music is more important than the man behind it. “I want my songs to connect people, and for them to recognise the themes of life in my work,” he adds. His seventh and latest album, Songs of No Fixed Abode, certainly contains many recognisable themes, from musings on love and loss to joyous nostalgia for a 1960s childhood. Paul, who grew up in Yardley Wood and began playing the guitar aged 14, says he was brought up in the folk tradition, and like many of his generation was also influenced by The Beatles and Simon & Garfunkel. These influences are all clearly evident in his music, which also draws heavily on Paul’s personal experiences. For example, one of the album’s ballads – Never on Parade – is a paean to Bill Oakley, a Barnt Green “character” and Paul’s erstwhile neighbour, whose death in 2012 revealed secrets from an extraordinary life. The jaunty songs Old 45s, Jamboree and The Edwards Boys reference simple pleasures from a bygone era, while the hypnotic, chant-like backing of Bonifacio transports the listener to an eerie Corsican town. Country, bluegrass and Celtic influences can be heard elsewhere on the album, which was produced in the South of France and launched at Artrix earlier this year. Four years in the making, Songs of No Fixed Abode brought together various musicians in the Dordogne studio of top producer Terry Bradford, who had suggested a collaboration. Paul and his wife, Jane, who performs vocals on this and his previous two albums, had to take lots of trips to France: “which wasn’t too hard as it’s a lovely setting! The album was a labour of love, and I’m very happy with it,” says Paul. It’s not the first time Paul has found inspiration further afield – his career really began on the Isles of Scilly, where he was taking a break from his O-Levels. Two weeks turned into three years, and school became a distant memory as he discovered his songwriting abilities and also performed in a folk club. By the age of 20 he had two albums under his belt. The 2004 album, Quiet Gifts, was Paul’s breakthrough work, with the title track being recorded by Irish folksters The Fureys – although he feels there is greater intimacy when he performs his own songs. 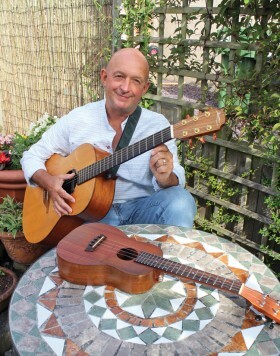 Alongside writing and performing, Paul has spent many years passing on his skills to young people through lessons and workshops in guitar and ukulele. This has also rubbed off on his own daughter, Jo, who runs The Star Project theatre school for youngsters in Barnt Green and Solihull. Meanwhile, Paul is the founder of folk-roots concert club Shining Friends, which he set up in 1998 in order to host musicians he admired in local venues such as Lickey’s Trinity Centre. It’s still going strong, with around four concerts per year – as we went to press, Shining Friends was preparing to welcome Canadian roots and ragtime group My Sweet Patootie to Burcot Village Hall on October 1. On Tuesday December 20 there’s festive folk with St Agnes Fountain at St Andrew’s Church, Barnt Green. Doors open at 7pm for 7.30pm start, tickets cost £18, and you can bring your own drinks.